My idea for making candles started after visiting a local Arts and Crafts fair at the Palm House in Sefton park before Christmas. So many stalls had handmade candles, but were a bit pricey. I thought that if they were that easy to sell, they must be easy enough to make! 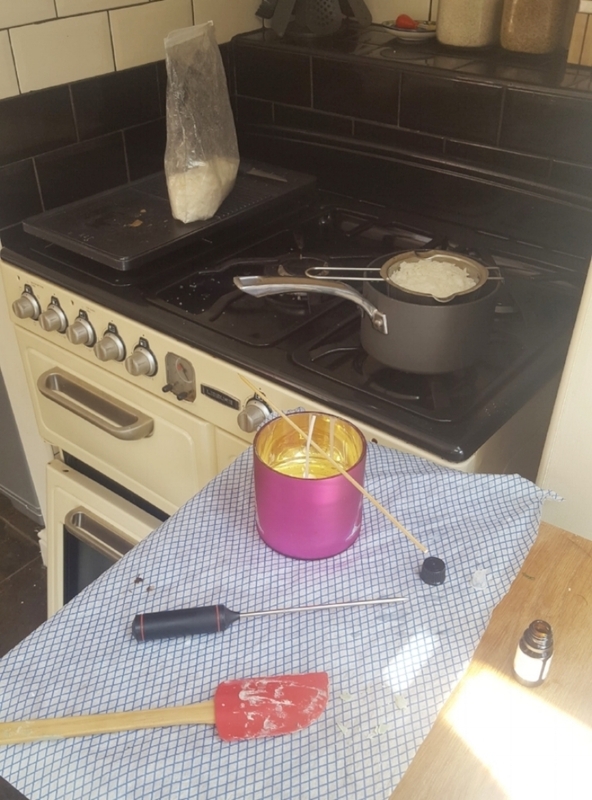 Over the next few weeks I looked online about the best wax that would give the best result for a reasonable price, the best containers that would not smash with the heat, and the physical process of making a candle. Beeswax. This tends to be naturally yellow in colour with a delicate sweet smell, and can be bought online in blocks or pellets for £8-£12 per kilo. It is the oldest recorded way to make candles and was used commonly by the Egyptians all that time ago! Soy wax. This is what I use at the moment, partly because it was less expensive than Beeswax, but also because it is made from natural products, and easy to use. It copes well with added essential oils and most wax sold is for container candle-making, with a steady melting temperature. 2 1kg bags cost me £10.53 with free delivery from Amazon. Paraffin wax. This is what is mostly used for making mass-produced candles, purchased without scent and in bulk. It can be bought in lots of different forms, for different melting points and is easily made into various types of candle (pillar, votive, container etc). Many people have moved away from using this wax because it derives from a petroleum gas, but it is part of the bi-product that would otherwise go to waste. Gel wax. This is used in some candles that you see with objects in them like shells and sand, making a nice beach scene! I don't think I would use this, and as it is rather different to the other three waxes above, I would not be confident that my method would give good results with gel. Mine was super cheap (look for deals as I got this one for £1.76) and shows temperature in Celcius and Fahrenheit, the latter which I use in this guide due to the more accurate, higher temperatures. I spent ages looking for the right one, and I actually think mine is a little too small. They are used more commonly for chocolate, but you can always start with one like mine - bought for £4.29 at the time, so again look for deals - and then consider buying another once you know whether it will get a lot of use. There are many variations of wicks that you can buy. I looked at many reviews and brands, but settled for ones with a metal bottom attached (I thought it would be too fiddly to buy these things separately and put them together). I also advise pre-waxed. they come in all lengths and I got 20 for £2.50. This is an optional extra, adds to cost of the candle, but can be really lovely if you're making a gift for someone. I bought mine from tk maxx for £5 and used 10ml (half a bottle) for making the candle in the photos. I have used votives bought from shops, recycled jam jars, pickle jars... anything that can be washed and I am confident will hold the heat of the burning wick. The votive in the picture was £4 from TK Maxx. Spatula - one that you are happy to never use for cooking again. Dish cloth / towel / newspaper- something you are willing to ruin that can cover your work surface. A long skewer, old pencil/pen or stick - this is used to help support the candle wick when you pour in the melted wax. You can use anything that will hold firm. So now you have everything you need. use the photos below to guide you through, and let's get going! 1. Create your workspace - it can get messy! I lay a dish cloth over the work surface closest to the hob, so that I am minimising space that melted wax can fall on to. 2. Fill a saucepan with boiling water and put the double boiler on top, making sure it fits nicely and won't slip or fall. Soy wax flakes over a saucepan of boiling water, on high heat. Place the wax in the double boiler over high heat, making sure the saucepan won't boil dry. It usually takes around 15 minutes for all the wax to melt, so give it a stir every few minutes. 4. Can you feel the heat? The wax needs to get to 160 - 170 degrees Farhenheit before you take it off the heat. Use your thermometer and watch the numbers rise to the correct temperature. How much wax you use depends on the size of your container. 500g will fill a half litre volume, so if you know the capacity, great! Otherwise you can always underestimate and then top it up. Remember to give it a stir, being careful not to spill the melting wax! Once the wax begins to melt, dip the base of the wick in to it and stick it to the base of your container. Hold the wick firm and central, until the wax solidifies and changes colour. You will need to hold the top of a wick for a minute or two, to make sure it sticks. It can sometimes take a few attempts! Using a skewer or pencil will help keep the wick upright. If you fancy a scented candle then add as much or as little as you would like. you do need to use quite a lot (up to 30ml for a large candle) If you want a smell that you'll notice on entering the room. After pouring, give it a good stir for 30 seconds. 6. remove from the heat and cool . you want to cool the wax to between 130 and 140 degrees farhenheit before pouring it out. it will only take a few minutes, and will be even quicker if you take the double boiler off the saucepan and place it on a heat-proof surface. watch your thermometer as it can all happen rather fast. 7. pour out your candle! carefully, holding the wick with one hand, pour your wax slowly into your container with the other. save a small amount of wax for topping up at the end - this is important. once you have finished pouring, use the skewer to position the wick and keep it central. make sure you're working on a flat surface! 9. Repeat the process if you have a larger container - this candle took 2 batches of wax as my double boiler is small. Allow several hours, or overnight, for the wax to set. Accept that most of the equipment will always have wax on, but make sure your saucepan and work surface are cleared and cleaned. You will find that once dry, the wax comes away from the edges of the container slightly, and leaves a small dip at the centre, around the wick. Reheat and use the leftover wax to fill in these areas and level off the surface, leaving a lovely finish. Trim the wick making sure it is level with the top of your container, and now enjoy your candle!! Let me know below what you think. Do you have any further tips or advice from your own experience? do you have any questions about making candles? let me know in the comments below. i forgot to take a final photo of the finished candle as i was too excited to give it to my friend. this large candle, including the container and the essential oil cost £8.50 to make. if i had bought one of this size and quality, it would have probably cost around £30-£50, depending on the brand. excluding cooling time and topping up, it took about 40 minutes to make, and is very therapeutic. i have made other unscented candles in recycled jam jars and they cost about £1 to make. with a ribbon around them and the jar lid on for initial presentation as a gift, they are a brilliant present for birthdays or christmas.